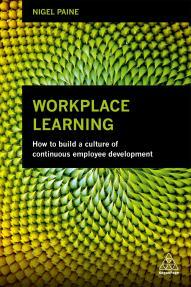 My latest book is called Workplace Learning: How to Build a Culture of Continuous Workplace Development . It is published by Kogan Page and is available world-wide. Please purchase from the www.koganpage.com worksite. If you order from here, and add the code: FRIENDSOFNIGEL at checkout, you will get a stonking 20% discount and free p&p in US and UK.